Chili Gold is a video slot game that comes from Amaya Gaming that is based on the Mexican lifestyle, especially spicy chilies to be exact. So, everything we see here reminds us of Mexico. The man with a hat and the mule on each side of the reels are just there for a comical effect. The sound effects are complementing the theme and they add cheerful feel to the game. There are a couple of special symbols in Chili Gold that we want to see more often on the reels. The big shiny chili is the wild and it appears stacked on the reels. Its function is to substitute for every other symbol except for the scatters to complete a winning line, and 2 scatter symbols. 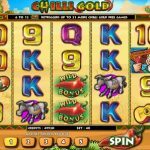 The interesting thing here is that the main feature, which is the free spins round, is activated with stacked wild chili symbols. To activate the feature you need to land between 6 and 12 and for that you will receive 3 to 21 free spins. During the free spins round, gold chilies are added to the second, third and fifth reel and they will act as wilds in order to help you land more wins. 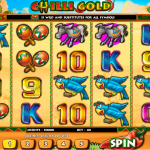 Chili Gold is a very interesting and festive video slot game. This title comes from Amaya Gaming family and it is one that is definitely worth to check out. The game play is smooth and straight forward. The special feature is activated in a slightly different manner which makes the game more interesting and challenging as well. The betting options are made in that way that every kind of a player can find the right bet size for them. We highly advise you to give this game a try. 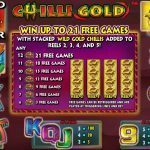 If you loved this one and want to try the second game in this series then consider playing Chilli Gold 2 a 5 reel slot by Amaya.